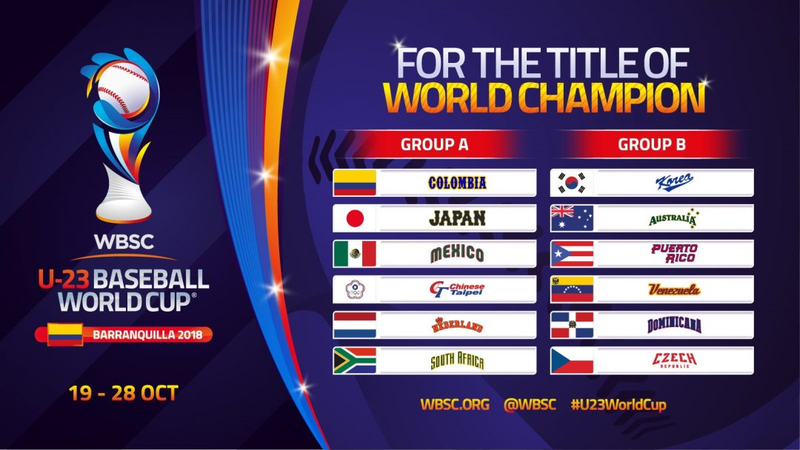 The World Baseball Softball Confederation today announced the group draw for the WBSC U-23 Baseball World Cup® 2018 – the year’s top international baseball competition – which will take place in Barranquilla and Montería, Colombia, from 19-28 October. “The groups of the U-23 Baseball World Cup are both global and balanced, and will lead to exciting and challenging games for the athletes and National Teams from day one,” said WBSC President Riccardo Fraccari. Group A features representatives from Africa, the Americas, Asia and Europe: host/world No. 16 Colombia, No. 2 Japan (defending U-23 World Champion), No. 5 Mexico, No. 6 Chinese Taipei, No. 9 Netherlands and No. 26 South Africa. Group A competitions will take place at the newly inaugurated US$ 33 million, 12,000-seat Edgar Renteria Baseball Stadium in Barranquilla. Group B features representatives from the Americas, Asia, Europe and Oceania: No. 3 Korea (2016 3rd-place finisher), No. 8 Australia (2016 runner-up), No. 10 Puerto Rico, No. 11 Venezuela, No. 12 Dominican Republic and No. 18 Czech Republic. Group B games will be held at the 12,000-seat June 18 Baseball Stadium (Estadio de Beisbol 18 de Junio), home of the Colombian Professional Baseball League’s Leones de Montería. The top three teams from each group will advance and go head-to-head in the Super Round. At the last U-23 Baseball World Cup in 2016, National Team rosters included players from clubs affiliated to the Australian Baseball League, Chinese Professional Baseball League, Korean Baseball Organization, Major League Baseball, Mexican Baseball League, Nicaraguan Professional Baseball League, and Nippon Professional Baseball, in addition to other leagues from around the world.